Our UCF Test Prep staff contributes to the development and administration of the review courses for the GMAT, GRE, SAT, GED, LSAT, MCAT, PCAT, DAT, OAT, TEAS, and the FTCE Exams. Each review course offers an overview structure of the test, successful study techniques and strategies on the exam content, and sample tests. As part of the University of Central Florida Division of Continuing Education, we believe in the UCF Creed of Integrity, Scholarship, Community, Creativity and Excellence as the core values that guide our conduct, performance, and decisions. Please review each course for more details. Our university based discounts presently apply to our GRE & GMAT review courses. For our SAT review course, the discount can be applied to children of UCF Alumni. Take advantage of this great benefit! University based discounts do not apply to the following subject exams: MCAT | PCAT | OAT | DAT | FTCE | TEAS | and all online review programs. The Core Mathematical Concepts for Students is designed to familiarize you with the basic math concepts that are tested in the GRE, GMAT, and SAT. These exercises are designed to reacquaint you with concepts that you may not have seen for some time. These pdf-based worksheets assist you practice in the various types of problems for each math concept area, and the different ways each concept is used. There is also an Answer Key for you to use to check your work. All of these files are in PDF format. If you need to download Adobe Reader please visit the Adobe Reader website. Students who have graduated and received a degree from UCF qualify for the alumni discount. The discount is also extended to those about to graduate from UCF within the same term as the review course and current UCF Staff and Faculty members. For SAT only, the discount can be extended to children of UCF Alumni. We do not have statistics on the test scores because, most students take the test right after they complete the test preparation course and there is no requirement for them to report their scores to UCF Continuing Education. What we do have are extremely high indications of instructional satisfaction through documented feedback from test preparation students listed on our website. Full payment is due before the class begins. If you decide to set up a payment plan, you must fill out a Deferred Payment Plan Form. Contact our office for more information and for approval. Should I take the GMAT or GRE review? The GMAT exam is required for the MBA programs and most business graduate schools. Non-business graduate schools usually require the GRE exam. Students are advised to consult with their school department to see which test scores are required. On the "Resources Tab" we have helpful tutorials to familiarize you with core mathematical concepts. These exercises are designed to explain concepts that you may have not seen for some time. There is an answer key to use with each exercise so you can check your answers. If you are having trouble making payment or logging in, please contact UCF Test Prep at 407-882-TEST (8378) or CEprograms@ucf.edu to complete your payment. Please contact us if you know in advance that you will be missing a class or if you have already missed a class after the course has started and we will notify the instructor. We will work with the student based on the conditions of the absence. This transfer policy applies only to the Test Prep review courses in the subject areas of GRE, GMAT, FTCE and SAT courses. For transfers related to MCAT/PCAT/OAT/DAT or LSAT courses contact our office at 407.882.TEST (8378) as all MCAT/PCAT/OAT/DAT and LSAT course transfers will need to be handled on a case-by-case basis. UCF Test Prep Administration will approve all transfer requests, and notify the student of the decision and any pertinent information. Instructors do not have the authority to make decisions on this policy. Notification to instructors does not constitute transfer from the class. The required UCF Test Prep Transfer Request Form must be completed and submitted for review. 1. Complete the transfer form: You, the student, will need to notify the Division of Continuing Education that you wish to transfer from the course that you are registered in. 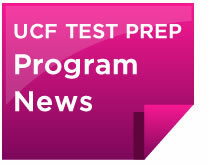 You will need to download the transfer form from the UCF Test Prep website. This is the first step in the process and the most essential. We will consider your transfer request active the day and time that we physically receive the signed form. Any transfer forms received outside of our regular business hours of Monday thru Friday, 8:00 AM to 5:00 PM will be considered "received" on our next regular business day. 2. Payment: There will be a payment required for transferring to another course. A percentage of your registration fee will be applied as a credit to the course that you want to transfer into. The credit will be determined based on how much of the course is remaining, and not on how many classes that you have attended or missed. We will determine the remaining time for the course from the point in time we receive the transfer form, not from the time it is dated and signed. Only class times that meet after we receive the transfer form will count as remaining course time. This credit will be applied to the current registration fee of the course being transferred to, and any resulting remaining balance will need to be paid by the student. There will also be an additional, non-refundable, transfer fee of $50.00 (fifty dollars) that will be added to your registration fee. The $50.00 transfer fee is required to be paid regardless of how much the credit is calculated as. Registration Fee Clarification: If you transfer to another course you will be in the same fee category as the class you are transferring from. For example, you may not transfer and switch from the regular Registration rate to the Alumni rate (unless you have graduated prior to taking the new course). Example of How the Credit is Determined: The amount of your credit is determined by how much of the course is remaining. And then subtract the number of hours the course has met (ex. 2 class meeting at 4 hours each equals 8 hours that have met). This will give us the remaining number of hours the course has NOT met (ex. 24-8 = 16 hours). The remaining amount of class will then be divided by the total number of hours for the course (ex. 16/24 = 66.7%). This is the percentage of your fee that will be applied to the registration fee transfer course. Sample: Orlando was taking the 16-hour review course, but after two class meetings Orlando decided that he wants to transfer to the 24 review hour course. Orlando paid $549 for the 16-hour review course, and the 24-hour review course fee is $700. How much will the credit be and how much will he need to pay? Orlando's class meets for 4 hours each session and there have already been 2 class meetings, so 8 hours of the course have already met, and 8 hours or 50% of the course remains. Orlando will receive a credit for 50% of his $549 registration fee that will be applied toward the $700 registration fee for the transfer course. After the $274.50 credit is applied, Orlando is left with a $425.50 registration fee. Once the $50.00 transfer fee is applied to the remaining registration fee of $425.50, Orlando will need to pay $475.50 for transferring into the 24-hour review course. Transfers for LSAT and MCAT/PCAT/OAT/DAT will be handled on a case-by-case basis, please contact our office at 407.882.TEST (8378). No portion of your registration fee can be applied to another DCE program or transferred to another person. UCF Test Prep will not refund textbook purchases, nor will we supply the textbook for the transfer course.